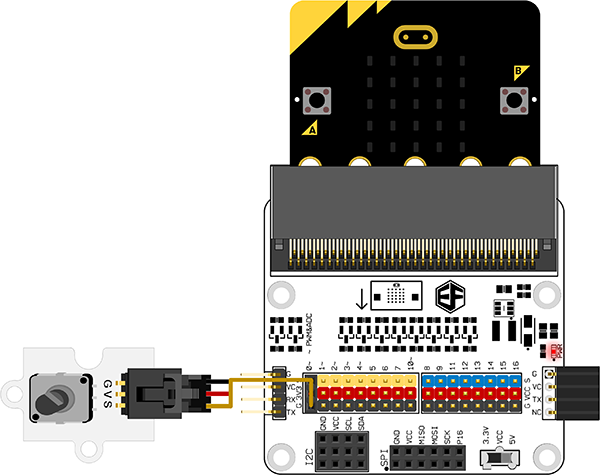 Octopus Analog Rotation Brick is arduino compatible and can be rotated up to 300-degree. It is based on the potentiometer. With the Arduino IO expansion board, in combination, it can be very easy to achieve position-dependent interaction with the rotating effect or produce MIDI instrument. Connect analog rotation brick to P0 port on OCTOPUS:BIT. Rotate the knob on analog rotation brick in clockwise direction, then LEDs on micro:bit screen will be turned on gradually. Rotate the knob in anti-clockwise direction, then LEDs will be turned off one by one.